Panasonic ES RW30 S Review : Electric shavers have been in the market for quite some time now. While some of us are huge fans of the rotary shavers, some just can’t do without the foil headed ones. Panasonic which has been a trusted brand in electronic goods since time immemorial has made a mark for itself in foil head shavers as well. They have foil head shavers in almost every price range and you can choose from a host of them depending on the features that you want your shaver to have and the amount you can spare for one. We have already discussed about quite a few Panasonic shavers in the previous articles. Today we would concentrate on one of the basic models that Panasonic has. Let’s have a look at the Panasonic ES-RW30-S Dual-Blade Electric Shaver. This is a queer looking electric shaver which resembles a robot when viewed from a side. The silver and black matte finish plastic body tapers from both sides in the middle of the device. The curvature gives an ergonomic grip to the device which enables you to hold it comfortably. The rear and the sides of the shaver handle have a textured rubberized grip. This grip is anti-slip in nature and will keep it from slipping off your hands even when they are wet. The power button is placed in the middle of the shaver handle. The shaver head is attached to the handle via a small neck which enables it to move back and forth. 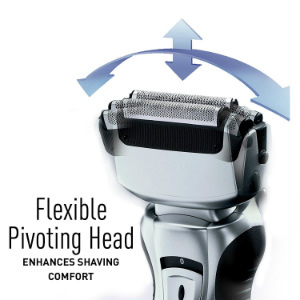 The Panasonic ES-RW30-S Dual-Blade Electric shaver has a pivoting shaver head. This pivoting head has two distinct cutting elements. The cutting elements are floating independent of each other. Each cutting element has a micro thin foil with an inner blade. The micro thin foil helps in moving closer to the skin so that the hair strands that enter the small holes in the foils are snipped off by the inner blades and you get a closer shave. Panasonic has replicated the Japanese art of making exceptionally sharp and durable swords to build super strong and sharp blades. This technology gives the blades an edge over its competitors. This helps in reducing the risk of tugging or pulling. The blades and the super thin foils are made of stainless steel and are precision honed. 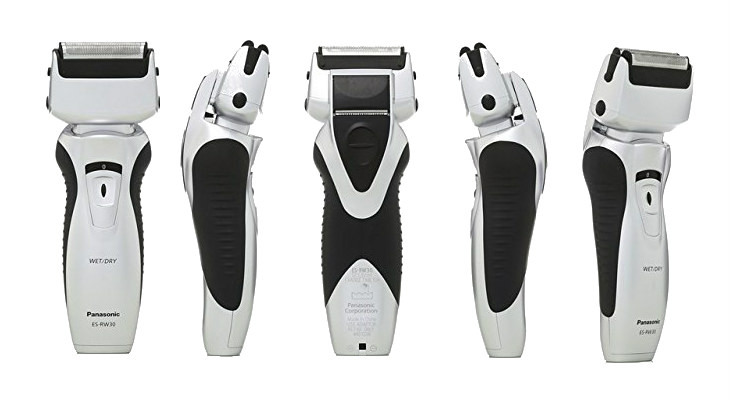 The floating foils along with the pivoting head ensures that the shaver head can easily glide over the contours of your face and would give you a smoother shave with minimum number of passes. It also helps you in easily working your way through the problem areas like the jaw-line, neck and chin. The blades are powered by a high velocity motor drive that maintains the efficiency and speed of the blades throughout the charge life giving you the same performance every time. The Panasonic ES-RW30-S Dual-Blade Electric shaver has a pop-up trimmer attached to it. It is placed just at the back of the shaver head and can be activated just by opening it. 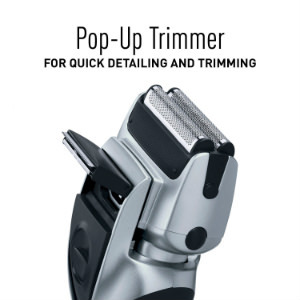 This pop-up trimmer is extremely important in doing the side burns and the moustache and adds precision to them. Though it may not be a full length trimmer but it serves the basic purpose and being attached to the shaver, there is no fear of losing it. The Panasonic ES-RW30-S Dual-Blade Electric shaver can be used both in the wet and dry mode i.e. 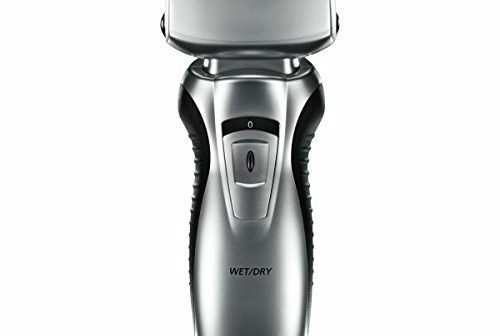 you can use this shaver dry or along with shaving creams or gels or even take it to a shower. A wet shave may mean that you have to make more passes to get a clean shave as there are chances of missing the hair strands with this shaver in a single pass but it is usually less harsh on the skin compared to a dry one and will leave you with a smooth irritation free skin. But when you are in a hurry and need to make a quick pass at it before you go then you can use it dry. 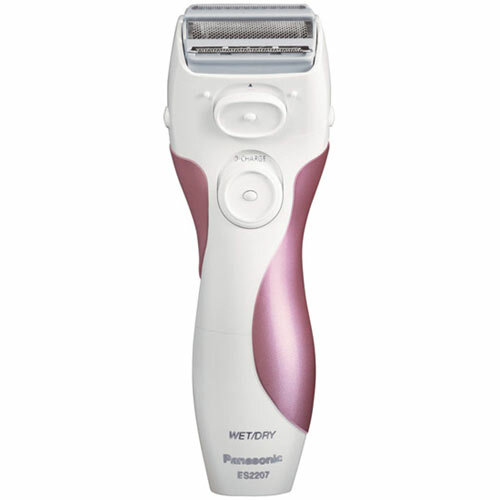 The Panasonic ES-RW30-S Dual-Blade Electric shaver is rechargeable. It takes 15 hours to charge fully and will last for 21 minutes of shaving time. The charging time is exceptionally high and the cordless usage time too low compared to its counterparts. The Panasonic ES-RW30-S Dual-Blade Electric shaver is directly fixed onto an AC rechargeable unit and does not use a power cord for charging. Cleaning and maintenance is easy with the Panasonic ES-RW30-S Dual-Blade Electric shaver. 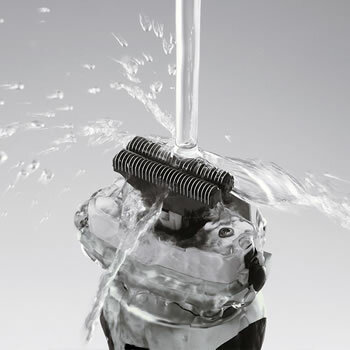 The shaver is 100% waterproof and the shaver head can be easily cleaned under running tap water. It’s better to use warm or hot water to free it from residual foams or creams if you have used one. The shaver comes with a cleaning brush that aids in the maintenance of the foil head. But the foil head has to be cleaned regularly after use so that the foil head is not clogged and the shaver can last you a longer time and also to maintain the hygiene. The Panasonic ES-RW30-S Dual-Blade Electric shaver comes with a two year limited warranty on this product. Given the fact that this is a very basic model from Panasonic we would not expect much but we are really astonished at the features that it flaunts and it is definitely worth the price that you would spend in owning one. It’s a complete value for money though we would want it to come with a better battery.